The Beast from the East | Notes from the U.K.
Button up, kiddies, because we’re going to talk about Britain’s recent storm. I’m limping in well behind the event, but I usually do. It’s part of my charm, and you’re just going to have to take my word for that. At the end of February, Britain got whacked with a snowstorm, called, since it came in on an east wind, the Beast from the East. It shut the country down. How much snow does it take to do that? Drumalbin, in Scotland, got 50 centiwhatsits. That’s in the neighborhood of 20 inches, which—Minnesotan that I am (or was; I could argue it either way)—even I will admit is enough to count as a legitimate snowstorm. Further south, Cambridgeshire got 26 centithings. Let’s call that a foot of the stuff. It blows around, so I don’t feel the need to be exact. 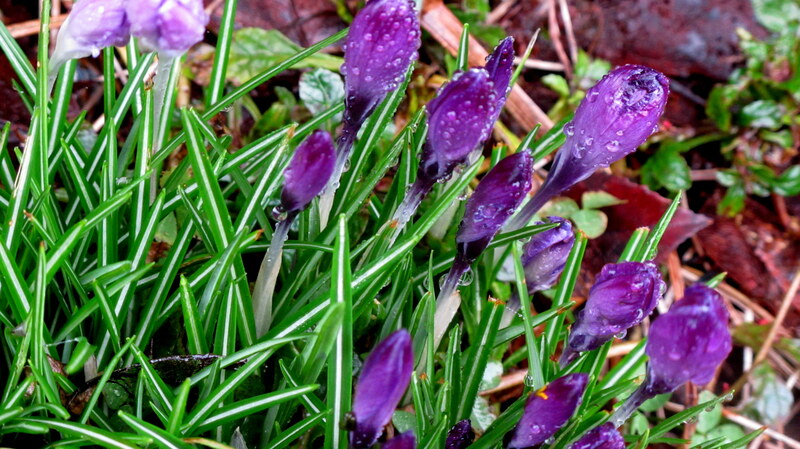 Relevant photo: Crocuses that survived the freeze. Here in Cornwall, we got less. I’ll come back to that. In the meantime, let’s talk about the country shutting down: Cars got stuck, turning highways into parking lots, and drivers and passengers got stuck with them, waiting in their cars for I have no idea what. Rescue? Instructions? Warmer weather? Enlightenment? I understand why you wouldn’t want to walk away from your car in a snowstorm, but on the other hand, how long do you sit with it? In one highway-slash-parking lot, the driver of a bakery truck gave up on the idea of delivering his goodies and passed them out to the folks he was stuck in the snow with. He was a hero, at least for a while, and got in all the papers. I’m not sure what happened when he got back to work—the papers haven’t covered that. If the bakery has any sense, they’ll give him a bonus, because they got great publicity, but I wouldn’t want to bet on that happening. Someone I know of took in drivers who got stranded near her house. They were with her for a few days. A woman was in the news because she left her car on the side of the road and walked to safety. She came back to find it had been towed and it was going to cost a shitload of money to get it back. And to make it worse, before she left it there she asked a cop if it was would be okay and he said sure, it would be fine. Schools closed. Roads closed. Trains were canceled. Houses lost power. The supermarkets ran short of milk, bread, fruit, vegetables, and whatever else you happened to want. The Daily Mail wrote scary stories about sixteen-inch snowdrifts. You Minnesotans, stop that. If you hardly ever see a snowdrift, sixteen inches is impressive. British friends say two things to us in these conditions. One: Isn’t it beautiful (or some variation on that)? It is and you can have my share. I’ve seen enough snow to last me several lifetimes. I don’t expect to get any extra lifetimes in which to spend my stockpile, but in case I do, I’m ready. Two: How is it that we can’t handle this when Canada/Poland/Finland/wherever it is you told me you’re from don’t shut down every time they have a snowstorm. It’s mostly true that they don’t, but any of those places can counts on having a fistful of snowstorms per year, so they invest in more than a fistful of snowplows, not to mention mountains of sand mixed with some strange chemical that melts ice and rusts cars. Their citizens are born clutching tiny snow shovels. It makes childbirth incredibly hard but once you get that out of the way, snowstorms are nothing. On top of that, people in those places know how to drive in snow. And the ones who just can’t learn? They get Darwined out of the herd not long after they get their driving licenses. Okay, now we can get to Cornwall: I can’t find a reliable source to tell you how much snow we got here, so let’s consult me. I’m anything but reliable, especially with numbers, but I am available. Where I live, in North Cornwall—which you can also call it East Cornwall if you’re in the mood; it’s not exactly the same, but it’ll do—we got an inch or two. South and west of us (that’s called down west), they got more. How much more? I wasn’t there, but it hit them earlier and seems to have caused them more trouble. The last Cornish snow I saw was wet. It packed into ice almost immediately, so it was lethal. That was eight years ago, give or take a year or three, and I didn’t drive in it. Anything around here that isn’t a hill is a curve, so driving on ice? I’ll just do some baking, make a cup of tea, and stay home, thanks. That’s one of the best things about being retired. But this recent snow was powdery and dry and easy to drive in, and the temperature–unusually–was far enough below freezing to keep it from half-melting and then turning to ice. Even I will admit that it was pretty. And as soon as a decent layer had fallen, the streets around us blossomed with parents pulling small kids on plastic sleds, which was also pretty. Where did the sleds come from in this land of almost no snow? No idea. Fax, maybe. You order them online and the machine spits them out almost immediately. I’ve heard that up on the moors the snow was heavier. Whatever weather the rest of Cornwall gets—wind, rain, heat, snow (you notice I haven’t mentioned sun)—the moors get more of it. The county did some plowing and salting, but they start with the main roads and we’re on the way to nowhere, so they wouldn’t get to us before July, by which time its sort of beside the point. Around us, it was farmers who did the plowing with their tractors. Of course—and I say this for the benefit of people who’ve never lived with snow—when roads get plowed, snow gets pushed to the side, and if you have a driveway guess what happens to it? A lovely, dense layer of snow compacts across it and if you hope to get out you have to shovel your way through it. It’s heavy, heavy work. I did it a lot when I lived in Minnesota, sometimes breaking a (much too narrow) slot through the snowbank in front of the house so we could reach the street and sometimes to dig our cars out after the alley had been plowed. Okay, I admit it: Some years we didn’t get that slot to the street cut after the first storm, and with each storm that followed it became harder to shovel through the snowbank. Getting from sidewalk to street involved mountaineering. Our excuse was that it’s damn hard work. And in Cornwall almost nobody owns a snow shovel. We don’t even own a snow shovel, never mind a–oh, what are they called? Not icebreakers–those are ships. And not ice scrapers–those are for windshields. I have been gone a long time. One of those blades on a shovel-type handle that’s meant to deal with ice. Anyway, for lack of the right tools, people end up trying to dig themselves out with soup spoons. So that was the Beast from the East. Not at all bad where we were but tough further north and on the moors. The next day, the Beast from the East met a wind from the west, a storm named Emma. (I’m not sure the Beast from the East didn’t get a formal name while Emma did. Weather people move in mysterious ways.) The combination brought freezing rain to Cornwall. Everything had a nice, slick layer of ice on it, and that stuff can kill you. What did my partner and I do? Stayed the hell indoors. I may call her Wild Thing, but she’s not that wild. With the ice, the village was cut off. Again,we’re on the way to exactly nowhere. It would take the county as long to get around to salting our road as it would take our current national government to locate both its brain and its heart. So when the driver who was supposed to deliver milk to the village store called to say he wasn’t coming because if he once got into the village he wouldn’t get back out, the store put out a call on Facebook, asking if anyone with a four-by-four could meet the truck. The store got its milk. That’s life in a village. For what it’s worth, I’ve never owned a four-by-four, but I’m pretty sure they’re no better on ice that a two-by-two. Never mind, though. They got through. It wasn’t just the snow and ice that affected us, though. The houses around here are built—oddly enough—for Cornish weather, which rarely dips below zero and never stays there long. Except when it does. What I’m trying to say is that water pipes seem to be put in any which way. Okay, I’m not a plumber. I’m sure a good bit of thought goes into them, but a friend’s water pipes turned out to be above ground. Insulated, but above ground. That looked like a sensible thing to do when the house was built. Guess whose water pipes froze solid for a few days? In northern Minnesota, the frost reaches five feet into the earth. In southern Minnesota—we’re soft down there—it only goes down 3 feet, six inches. Wild Thing and I were told once that footings had to go down either six or seven feet (I can’t remember which) to keep the frost from messing with them. Water pipes? They go through the center of the earth. Just to be safe. Our friend wasn’t the only one whose pipes froze. So did an assortment of other people’s. So did water mains all around the country. Parts of London went without water for days—long after the temperatures rose. The day after the freeze, as the temperatures rose and the ice started to melt, the delivery trucks reappeared and the store ran out of milk. The dairy’s pipes had frozen and it took them a day or so to recover. The supermarket’s shelves were still pretty bare days days after the thaw. The thaw? It came the next day. The temperature got up into the forties–above zero for the metrically inclined–and the whole mess disappeared and we got back to normal. Even the daffodils, snowdrops, crocuses, and primroses that had frozen (see the rare relevant picture, above) recovered. When I lived in Minnesota, I longed for weather that behaved that way. A week or so later, another storm system brought snow and ice warnings (and I think some actual snow and ice) to the north of us. It was called the Pest from the West. This is what happens when a country starts naming its storms. People have way too much fun with it. This entry was posted in Weather and tagged cold weather in Cornwall, Cornish weather, snow in Cornwall, storm Emma, the Beast from the East by Ellen Hawley. Bookmark the permalink. I heard somewhere, the reason why Britain collapses from a snowflake, is because the government decided (and rightly) that its not worth putting in some of the stuff other countries have, such as heated paving because the cost of putting it in, compared to the country grinding to a halt every 7 years of so for a couple of days is not worth it, they have put in certain things in Scotland and North England as they get it more often. I don’t know how much it was a single decision–a bunch of people in a room discussing it–or just something the country drifted into piecemeal, but it does make sense. But heated pavement? Who, when, where, how? That’d have to cost a fortune and be wildly energy intensive. Unless it’s in Iceland, where they have all that spare geothermal energy sloshing around. Good lord. I can see the advantages, but I’m not convinced it’s a smart thing to do. I’m still not convinced. I start thinking about how many miles of pavement even a small patch of city has…. I guess it’d have to be. To tell you the truth, I hadn’t given the proposal much thought. Maybe we should. Grab some of the best ideas round the world and try them here. Okay, but I’m still against the heated sidewalks. Sorry. It’s important to be against something, don’t you think? I’m just the kind of grump who’d walk along saying, sure, they’re nice and all that, but damn they use a lot of energy. Right. We’ve found common ground. My pleasure. Thanks for letting me know. I reckon Its the millennial generation who are having the problem with the snow – and causing problems for us all by not knowing how to deal with it. To oldies like me, an inch or two of snow in the South of England isn’t a big deal; winters in the UK were a lot harsher in the 1950s, ’60s and even the ’70s, before global warming began to mess with the climate. We expected snow pretty much every winter – it never lasted for more than a week or two at the most, but we knew we’d get some. And nobody really panicked – we just got on with it. The people in charge of insfrastrusture and services, like roads, railways, the power grid, the water supply, the post, and food delivery kept the services going, and we all moaned a bit if the snow lasted for longer than we thought was reasonable. The people in charge of this stuff now are largely millennials in their mid to late thirties, and people in their forties who were born in the 1970s. They’ve never really experienced cold winters with snow and ice, so their health and safety conscious reaction to its occurrence is to panic and shut everything down, “just in case”. The further south you go in the UK the more ridiculous the panic you see, nowhere more so than in London. Two cm of snow and all the buses and trains grind to a halt “just in case”. This attitude isn’t helped by the (erroneous) perception that climate change means it’s not worth investing in snow ploughs and de-icing equipment – all very convenient when government agencies and local authorities are strapped for cash anyway in our austerity lead times. The reality is that climate change doesn’t mean we’re going to be having tropical winters in the UK anytime soon, but the politicians, managers and bureaucrats don’t yet seem to have grasped that. It’s quite the opposite – the consequence of global warming is that we’re likely to get more extreme swings of weather, and given that the UK is in one of the planet’s chaotic weather zones anyway, this is going to affect us a lot. So warmish winters, with sudden relativity extreme cold intervals, torrential rain and storms with very high winds, all pretty much at random, are going to become norm. The politicians, managers and bureaucrats are going to have to be prepared for this if they want our infrastructure and services to keep going in the face of sudden extreme weather events. Panicking and hiding under the bed ain’t going to be enough! Having said this, the people of Scotland and Northern England have always expected to experience harsh winter weather, and they are by and large prepared for it and able to deal with it. It’s those soft southern b*st*rds (as northerners affectionately call them) who just can’t hack it! You make some good points, although if I agree with that bit about soft southern bastards I may get run out of Cornwall, so I’ll register an official objection to that if you don’t mind. Or if you do. I’ve seen photos of a massive storm that hit Cornwall in the sixties. It carried enough snow to have paralyzed Minnesota and I don’t know how long it stayed. Weeks, I’m guessing. Just to clarify, the “soft southern …” isn’t my opinion (as a Midlander born, and an honorary Southerner, I’m ok with living in’t deep south). I should have put the phrase in quotes. When Northerners they say it, I think they’re they’re most likely to really mean Londoners – the residents of Cornwall (and maybe Devon) are probably excepted anyway. I know Cornish people who argue–vociferously–that they’re not English, but it’s hard to argue that we’re not southern. 1963, not just Cornwall. You can see footage and photos of it in various places online. Yep, weeks. Thanks for the year. I’ve seen photos of the village during it. If I didn’t know where it was, I wouldn’t recognize it. The 1963 winter in the UK was particularly bad. It seemed to go on for weeks. I remember endless cold days in the poorly heated classrooms at my “modern” (i.e.fairly recently built) secondary school. You make me wonder if an outdated building wouldn’t have been an improvement. My husband remembers it clearly, I recall only a bit of it but I was still a child, I probably enjoyed it! To a kid, yes, it’d be magical. In Minnesota, you could always find someone to say, “When I was a kid, the snowbanks were much higher than this,” and then someone else to remind the first person that when they were a kid, they were shorter. Send it away … I don’t want it again!!!! If it looks like another one’s coming in, I’ll stand on the cliffs and yell at it. Results not guaranteed, unfortunately. The snow’s going to hit Hertfordshire! No golf courses open for all those company executives. How will they cope? Disaster! Stop the trains. Shut down the country. Thanks. When I was still in MN, I longed for a place like this. I was sure I’d be a completely different person if I didn’t have to suit up as if I was stepping out of the spaceship for six months of the year. And y’know what? It turns out I’m halfway a different person here. It really has changed me. Thanks. That’s two of us. And Minnesota’s a quieter place since I left. As long as Anyname from the south doesn’t meet SomebodyMean from the West, it’s okay. Our ice storm came from a western wind that took a dip south then met the Beast. Anyway, spring’s coming. I promise. I just don’t want to commit about how long it’s going to take. I laughed as I read this. Oh, snow! And, oh, those who are not used to dealing with it. At the end of our driveway, the ridge left by the plow is a force to be reckoned with, and we have dubbed it “wall o’snow.” We have to get our car out, so the wall must completely come down. Anyway, we’ve had three storms similar to the Beast, and a fourth one is predicted for next week. Good times! The Wall O’Snow must feel like the wall at the end of the world if you’ve got to get the car out. Damn, that stuff’s hard to shovel. You got that right! After every storm, when we face the Wall O’ Snow, we droop in despair. Somehow, though, we always get through. Cornwall was prominent in my newspaper after Storm Emma, as a killer plant turned up on Porthkidney (really? that’s a name?) Beach. They were all over the place and looked like parsnips, but really they were Hemlock water dropwort roots (Oenanthe crocata), Highly toxic as in you’ll be dead tomorrow and today will be the worst day of your life. There really is a Porthkidney Beach: https://www.visitcornwall.com/beaches/good-beach-guide-2014/west-cornwall/hayle/porthkidney-beach. Porth is Cornish for port. Kidney is English for this sounds a lot like the original Cornish word but isn’t and what the hell, we don’t care. You do understand that I’m making that last part up, right? Some dead man’s fingers were found on our beach too, leading to many warnings on the village web site. What did the world do before villages had a web site? Eat fake parsnips and die? The ones I feel sorry for (and yes, I know the adults’ coats are made for this) are the spring lambs that are dumped by farmers into pastures that have barely recovered from a snowfall, enjoy a few days of warmer weather and then find themselves buried upturned-nose deep in heavy snowfall. In Minnesota, it was very much up to everyone to work out how they’d get out of their houses after the city had ever so helpfully plowed them in. The people who had it worst were the ones who lived in corner houses, because they really were expected to clear the snowbanks so people on foot could get through. But we did at least own snow shovels. And many had snowblowers, which I hated but came to see the point of. In our neighborhood, people tended to be helpful. If they knew someone couldn’t clear their own walk, someone would generally do it. And you’d often find people out clearing each other’s walks after a storm just because it was a nice thing to do. It was pretty impressive. I think Americans living in places like Minnesota are probably much kinder to each other (because they have to be) than the average person in the UK. I can think of many times, when I lived in London and people were snowed in, and nobody lifted a finger to help anyone. I’m not sure it’s about country but city size. Here in the village, people can be incredibly supportive. Minneapolis is a much smaller city than London, and people in our neighborhood knew each other–mostly. Good read Ellen! It seems odd that the UK gets so little snow as it’s so far north. The Weather Channel started naming storms some time ago which seems silly really. It’s the ocean that keeps it (relatively) warm. Deep water’s a heat sink–it cools (and warms) more slowly than the land. Plus we’re near the Gulf Stream, at least if the melting ice caps don’t divert it. I’m not sure what up-to-date models say about the likelihood–it’s something I read about years back and haven’t followed. If the Gulf Stream does take another path, we’ll be in considerable trouble, I expect. My first reaction to naming storms was like yours, that it’s silly, but as I started writing about it I realized that it gives us a way to both talk about and remember them. And people have always done it spontaneously. Minnesotans who were around then will still remember the Superbowl Blizzard and the Halloween Blizzard. This gives us a way to remember the ones that don’t coincide conveniently with a holiday or a sports event. We did not get a bit of snow this year in Oklahoma. It was 80 yesterday and will be today. Having lived in Fergus Falls, MN. and having gone to college at NDSU in Fargo I know what real snow is. This girl did her four years in 3 and headed straight back to south Georgia! You are very brave living in that stuff! It’s not always easy to tell brave from foolish. But 80 degrees? In March? That’s downright scary. Usually means a really hot summer. One year we had over a 100 days over 100 degrees. Even the chickens got in the pool! I can remember a few days over 100. Not easy to live with. I live for those days. Below 70 and I am not happy. We have a friend here who longs for hot weather. If she really had to live with it, she’d wilt. I know I did. Sounds very much like what happens in Atlanta, GA or other places here that “never get snow” until they do. We have a new CEO in our company here in Hartford, CT. He grew up in Buffalo, NY where, if the snow is measured in inches, it didn’t snow. People keep hoping the office will be closed. I’m glad the thaw has come and the Crocuses or Croci survived. So am I. It’s one of the things that reminds me I’m not in Minnesota now. Sorry to hear about the new boss. That’s really not fair. He’s not that bad, but he shrugs off 6″ of snow like it’s nothing (which it is). Six inches? It used to be nothing. Now, oddly, it’s a huge amount. We didn’t get any snow here in northern Florida this past winter, of course. But the frigid temps that hit the upper northeast in December and January did get us down to the teens at night a few times. Our condo was built for winter temps that only go into the low 40’s. Several times my wife asked me why we aren’t living in Miami. I had no answer for her! Glad to hear you got through your storm(s) safely. I used to work with a woman from Florida–this was in MN–and I remember her talking about how cold it got there when it dropped down below freezing, and how unprepared they were for it. Doesn’t Miami get that kind of weather occasionally, though? A RELEVANT PHOTO??? Are you feeling okay?? Good enough to pass for normal, thanks. In other words, not my usual self. I can–or so I like to think–do that when the situation’s grave enough. But I haven’t gotten normal enough to use emojis yet. And neither, I see with approval, have you. Oh, thank GAWD — there does seem still to be a little hope even for the likes of us, then. It was worrying me. Sleep well. It’ll all be okay. Although I don’t like snow, possibly because I’ve seen too many drivers do stupid things in it, I do despair at the tendency of journalists and weather people to panic at the sight of a single snowflake. You see them reporting on snow that’s allegedly causing problems, through which you can clearly see grass. Not that that was the case a fortnight ago. I suspect that it will be this weekend. I’m hoping it will be this weekend. One prediction has freezing rain coming Cornwall’s way. Oh no. That’s even worse than snow. We had that as well a fortnight ago. That was only the second time I’d ever seen it. It is bad–really immobilizing. In MInnesota, the ice (from snowbanks melting in the day and freezing at night) was much worse than the snow. We have snow again. A couple of inches. Less than an inch here and it’s melting–more decorative than real, but I’ve heard a few outdoor events have been canceled. Wow! Popular blogger I can see from all the comments. Enjoyed reading your post – love the humour. Popped across from Mostlyblogging’s Spring Party blog hop. Thanks for stopping by. I love the comments I get–some of them are a scream, and they keep me going. Thanks, Ellen, I did enjoy reading this. We didn’t get any snow in Swansea (as usual it stops at Port Talbot) so watched the snow-related hysteria on the news with bemusement. The Snow hysteria has since been replaced with Russian/spy-hysteria! Do the Russian spies stoop at Port Talbot too? As I write this, the temperature’s below freezing (the horror! the horror!) and we’re in full hysteria about freezing rain. Okay, not full hysteria, but we’re thinking about it. Hmmm. That’s an interesting question I hadn’t considered! We only had the tiniest dusting of snow here on the Gower Peninsula (South Wales), but the supermarket shelves were still empty for days, and the bin men refused to come and collect our rubbish – consequently there was twice as much rubbish as usual this week, which meant they could only collect half of it and had to leave the rest behind. Mine included. Not happy! The supermarket shelves were pretty empty here too, and today, when I did my grocery shopping, I overheard a few people talking about stocking up for the next few days. I’m hoping that’s hysterical over-reaction but the votes aren’t in yet. How many weeks will it take to get the rest of your rubbish collected? I dread to think! The worst of it is, if it’s left too long the foxes come and tear the bags open, and we end up with trash strewn all over the place. Don’t mention that to the council. In these days of endless budget cuts, they’ll decide the foxes can replace trash collection. Foxes, I’m told, don’t really understand money and can be convinced to work for scraps. Shoulda bought one of those flamethrowers Elon Musk was selling on the internet! Next time tie a couple of politicians to your front bumper, head first, and use those famous British stiff upper lips to plow the road. Wow, I had no idea that’s what the famous British stiff upper lip was all about. Yeah, I’m not much on that kind of fortitude anymore. If I ever was. What a relief! Having said that, there’s snow outside my window right now. We had something that looked very much like a real snowstorm last night, although I don’t think it dropped more than two or three inches. It’s melting as I type. Now that’s what I call well-behaved snow. Our daffodils looked that they’d had it, but once the snow melted they came back and look gorgeous. I wish I knew how they do that–it’s a trick I’d like to learn. In Minnesota, 6 inches wouldn’t slow anyone down much. But it happens more often, so yeah, it’s worth preparing for. Funny stuff, hm, this geography/snow correlation. Like you, I moved much to the south from snow-heavy Slovenia’s capital and this year’s snow was the first I experienced in my five years here. I woke up with it and it lasted until 1 pm. (Except on our table outside, there it remained for a day. It’s a cool table.) There were about 10-15 centithings of it. And ice on the turns. Still, I drove to the beach, I just had to take some shots. To see snow on the beach, olive trees and cacti seemed so wrong. (There was a post with photos, maybe you’ve seen it.) Amore was ecstatic that he was the only person in the radius of 400 km who owned an ice grater (or what’s it called, for grating the ice off the windscreen). He bought it in Slovenia. When I reached the car where he left it at the train station like every day I laughed. First I wasn’t able to determine which car was ours because all cars were white. He didn’t bother clearing the snow, except his side of the windscreen. It took me ten minutes, instead of melting it got harder. Not something I’d imagine doing almost on the coast of Tuscany. I enjoyed your account because nothing terrible happened (except that towing – I hope she gets reimbursed). There were baker’s goodies and milk. And your friend I hope had some good times those few days with her unexpected guests. There are no coincidences. But the best is the expression “to be Darwined out.” :D He was surely on to something. I think what you’re talking about is a scraper–the thing for the windshield. In Minnesota, they fell into two categories, long-handled ones (usually with a brush on one side and a scraper on the other) and short handled, which was good for ice because you could really put some power behind it. When we first moved here, we ended up scraping frost off our windshield with a credit card one morning and agreed that it was ridiculous for two Minnesotans to not own a scraper, even if we were living in Cornwall. I now own a short-handled one, imported from Minnesota. I’m careful not to lose it because I don’t know what it’d take to replace it. All I can tell you is that it’s not the New York I grew up in. We’d never even heard of kale. Once upon a time there were seasons. In the winter it got cold, in the summer it got warm. Now we have ‘Arctic Chills’, Heat Waves and Beasts from the East. Not to mention global warming and strange weather patterns. Loved this post – so many things I could relate to, hahahhaaa.